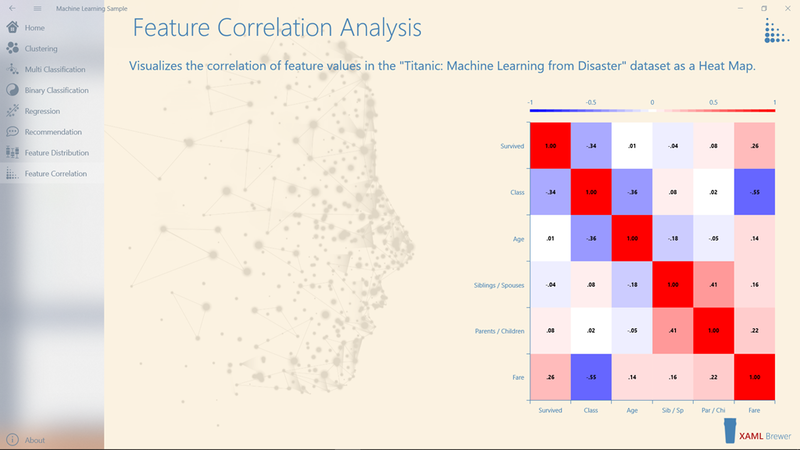 It displays the correlation between different properties in the popular Titanic passengers dataset: age, fare, ticket class, whether the passenger was accompanied with siblings, spouses, parents or children, and whether he or she survived the trip. The darker red or blue squares on the heat map indicate that the corresponding properties on X and Y axis have a higher correlation with each other. Higher correlation is a warning sign for possible negative impact on the classification model when both features would be added to the training data. The topic of this article is Feature Correlation Analysis. Just like in the previous article -Feature Distribution Analysis- we are in the “data preparation” phase of a Machine Learning scenario. We’re not training or even defining models yet, we’re selecting the features to train them with. 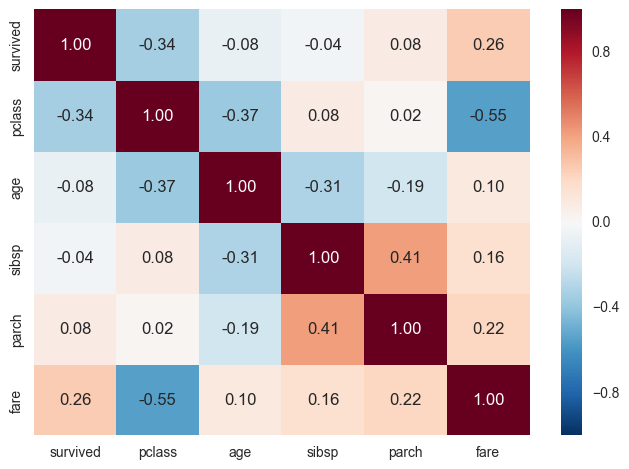 An ideal feature set contains features that are highly correlated with the classification (in ML.NET terminology: the Label Column), yet uncorrelated to each other. there’s also the cost incurred by adding features. Two features that are highly correlated with each other don’t add much value to a classifier, but they sure add cost at training, persisting and/or inference time. Machine Learning activities can be pretty resource intensive on CPU, memory, and elapsed time, so it sure makes sense to limit the number or features. The process of converting a set of observations of possibly correlated variables into a smaller set of values of linearly uncorrelated variables is called Principal Component Analysis. This technique was invented by Karl Pearson, the same person that defined its main instrument: the Pearson correlation coefficient – a measure of the linear correlation between two variables X and Y. Pearson’s correlation coefficient is the covariance of the two variables divided by the product of their standard deviations. It has a value between +1 and -1, where 1 is total positive linear correlation, 0 is no linear correlation, and -1 is total negative linear correlation. During Principal Component Analysis a matrix is calculated with the correlation between each pair of features. Highly correlated feature pairs are then ‘sanitized’ by removing one or combining both (e.g. by creating a new feature by multiplying the variables’ values). At the same time you also calculate the correlation between each attribute and the output variable (the Label), to select only those attributes that have a moderate-to-high positive or negative correlation (close to -1 or 1) and drop those attributes with a low correlation (value close to zero). 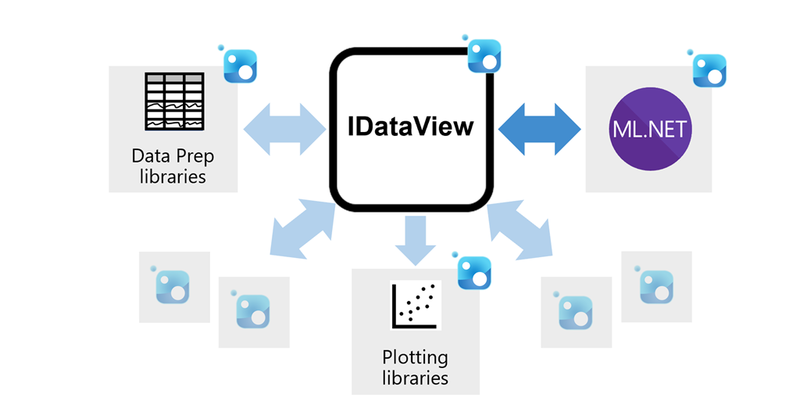 Data Preparation is outside the core business of ML.NET itself, but for retrieving and manipulating the candidate training data we can count one on its most important spin-off components: the DataView API. Now that we have all the feature values in arrays, it’s time to calculate the correlations. The MathNet.Numerics.Statistics.Correlation class from Math.NET hosts implementations for several Pearson, Spearman, and other correlation calculations. /// Computes the Pearson Product-Moment Correlation coefficient. For the sake of completeness: that same Math.NET class also hosts code to calculate the whole matrix. For the sample app this would require importing a lot more code (linear algebra classes such as Matrix) or adding the whole NuGet package to the project. All we now need is a way to properly visualize it. A heat map is a representation of data in which the values are represented by colors. They are ideal to highlight patterns and extreme values in rectangular data such as matrixes. blue for high negative correlation (value –1). This diagram also omitted the correlations on the diagonal: the red squares that indicate the full positive correlation between each feature and itself. 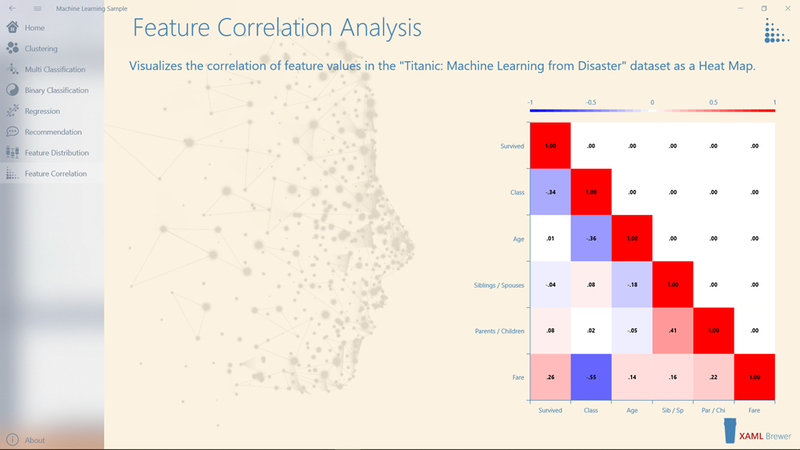 The above diagram was created with Python (Pandas and Seaborn) and shows the correlation between all the numerical values in the already mentioned Titanic Passengers dataset. 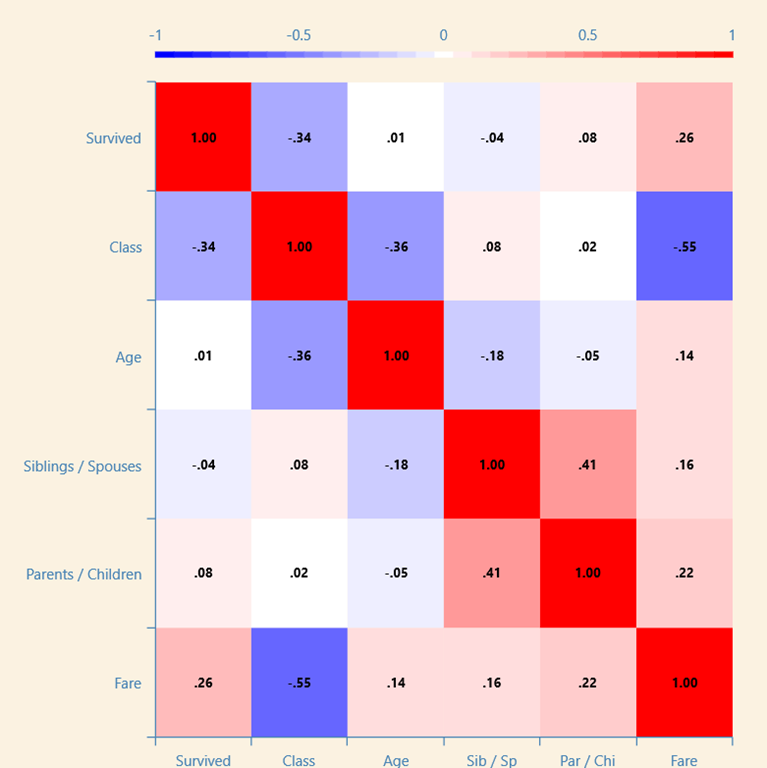 The small differences in correlations for the Age feature are caused by the sample app not compensating missing values. We have the matrix, let’s plot this diagram. // Pearson color scheme from blue over white to red. If you’re not entirely satisfied with the color scheme, feel free to create your own custom OxyPalette instance: it’s just a 3-color gradient. To display the label in the square you need to set the LabelFormatString. This will only be applied if you also set a value to LabelFontSize. The dark blue square on the diagram reveals a relatively high negative correlation between the Passenger Class and Ticket Fare. This means that the value for the one can easily be derived from the other – think “first class tickets cost more than second class tickets”. Adding both as a feature would not add more value than adding only one of them. Data scientists would probably extract a new feature from these two (something like “Luxury”) or would break up “Passenger Class” and “Ticket Fare” in more basic components, like locations on the ship that passengers had access to. Anyway, the heat map clearly highlights the feature combinations that need further analysis. 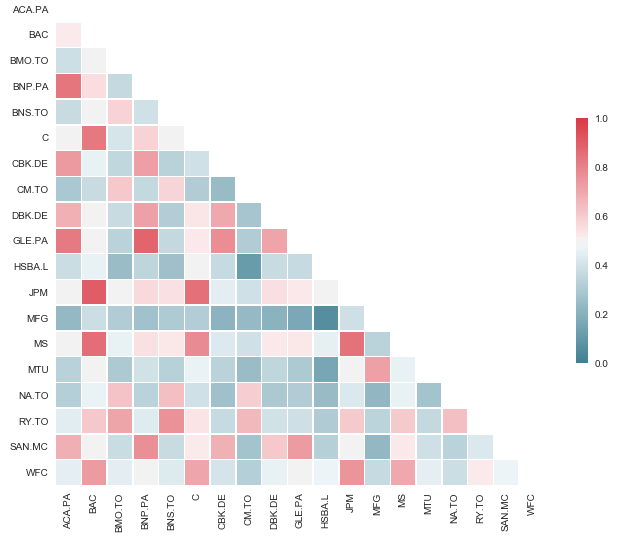 In this article we used components from ML.NET, Math.NET and OxyPlot to calculate and visualize the correlation heat map on candidate training data for a classification model. The UWP sample app host more Machine Learning scenarios. It lives here on GitHub. This entry was posted in Machine Learning, Math.NET, ML.NET, OxyPlot, UWP on March 4, 2019 by xamlbrewer.